Let’s talk about NAPs. Not the kind we took in 1st grade or the kind we accidently slip into in the middle of the day. We’re talking about your SEO NAP, meaning your Name, Address and Phone Number. If you manage any aspect of a business or organization, it is important to know what your online presence looks like. Here's your local SEO strategy for today. Before addressing anything else, you should look at your NAP consistency. What are NAPs used for? Search engines use your NAP citations to verify your business is not fake and to provide information to searchers based on their location. Did you know 72% of consumers who did a local search visited a store within 5 miles of their location? If Google sees inconsistencies, your online authority is diminished and your rankings decrease. So, in everything that you do online - from every social media profile you set up to every directory you list on - keep your NAP (name, address, and phone number) clean and consistent. It is easy for your business’s NAP to be inconsistent and incomplete. If your business or organization has been around for any amount of time, there are thousands of directories where your information has been dispersed on the interwebs. We did a citation audit for ourselves a couple years ago. In the 36 years we have been open, we have changed names, addresses, and websites. There was a lot that could be wrong. We found that we had the correct information for 250 listings, but incorrect information for 1,000 listings! It was a sobering moment. Ever move into a new place, thought you had your ducks in a row, but forgot to have your mail forwarded and address changed? So frustrating! The same goes for your business. The United States mail directory doesn’t always have it right, even though we depend on their accuracy, and digital directories are worse. Local search marketing is key for driving leads to your business from the internet. How often do you do a Google search for a business that you are looking at going to before you actually go there? Have you ever looked up a business’s address only to end up confused in a wrong parking lot? I’ve definitely experienced that very thing. With the increase of mobile devices and overall accessibility of the internet on the go, directories like Google, Facebook and more have given power to the people everywhere. In fact 78% of local mobile based searches resulted in a sale. This is the result of Google’s emphasis on local SEO. Now what would happen if searchers saw two different addresses associated with your business name? Would your customers end up in the wrong parking lot? Consumer’s risk to approach your business for a transaction is much higher when your basic business information is not consistent. Don't lose customers to your competition. Find out where your business information is wrong. Run a $9 citation audit and see what business information is being used by thousands of search engines and local directories. Who should check their NAP on business directories? In reality, any business owner should check their NAP. But more specifically, businesses who have ever moved, changed names, gotten a new website, or changed any other aspect of their business’s identifying info should check their directory listings with a NAP citation audit. The preliminary local SEO audit that you can do on your own in 2 minutes or less will let you know if you need a deeper citation audit done. Open up your favorite search engine - Google, Bing, etc. - and type your organization’s phone number into the search bar. Does the correct information show up? How about on page 5? Page 10? The key is to identify if there are any variations in your NAP (name, address, & phone number). Bottom line - your business’s directory listings may be correct on the big players like Google or Yelp but wrong on the 1,000’s of smaller but equally important ones. This preliminary check has shown that you may have inconsistencies spread far and wide due to the Spider Effect of Directories - explained below. Where does the information for your NAPs come from? Here’s a glimpse of how it work. You have Google that pulls information from their various data collection tools and compiles that with data from secondary sources. Now, those secondary sources have also pulled their data from tertiary sources, and so you can really start to picture how your fly of a business can get caught in this web of information passing. When you move or make other changes to your identifying business information, even going in to update major listings like Google and Facebook does not mean that your new information will be correct on smaller directories. Moz published a more detailed video on this topic. The way that Google has set up this theoretical system of checks and balances makes it difficult to find and fix every place that your information is. I mean, just try to wrap your mind around the scope of the information being passed in the "Local Search Ecosystem." It's no wonder that your fly of a business is stuck in the web of NAP information being passed between data aggregators, key sites, directories, and search engines. Who knew? 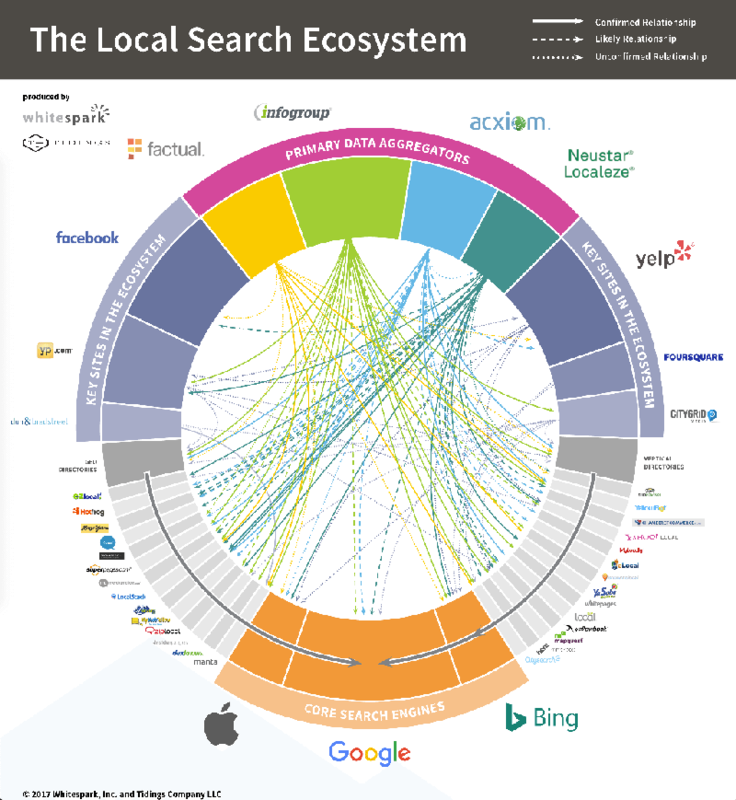 The Local Search Ecosystem, developed by David Mihm shows how business NAP information is passed through the internet, and by whom. Primary data aggregators are those whose business is to collect and update business and personal data and sell it to other companies. Search engines compile and display information from various difference sources, including internal sources. Key sites in this ecosystem can be either data providers or data displayers, and sometimes both. Directories also receive data from other sources and display it. What will a citation audit tell you about your local SEO? You want your NAP to be consistent, but you feel it's wiser to delegate that tedious responsibility since your time is limited already. So, where should you go from here to resolve these inconsistencies? You can receive a full citation audit with thousands of listings sorted by those that are accurate versus inaccurate for $9. From there, you can determine if it is necessary to follow up with a local citation cleanup. You will then be able to use this information to determine the next steps for cleaning up your business information across this internet. It’s time to get your business back in the game for local searches. If you want to know even more about how to get found on the internet, I or anyone on the Third Angle will personally talk to you about realistic solutions that your small business can afford. Are 85% or more of your search engine, social media, and business listing sites accurate?